The closest race in the Colorado House last cycle was between Republican J Paul Brown and Democrat Mike McLachlan in HD59. With the help of Obama’s field juggernaut, McLachlan was able to eek out a 900 vote win. Knowing that he barely prevailed in 2012, and represents a conservative-leaning district, you would think Rep. McLachlan would be careful to not kowtow on gun control to the Denver-Boulder corridor that runs his House caucus. Other Dems from rural areas, like Rep. Ed Vigil (D-Fort Garland) who has slammed the gun grab as “nuts” and “absolutely insane,” seem to understand their district. McLachlan apparently does not, but a group of 2nd Amendment supporters wants to make sure his constituents understand him. The ad ties McLachlan to the very unpopular New York Mayor Michael Bloomberg, who believes in banning not only guns but 20 ounce sodas. 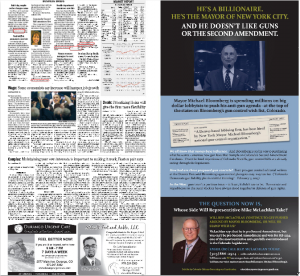 Bloomberg has been heavily funding Mayors Against Illegal Guns (MAIG), which employs a Denver lobbying firm that is pushing for gun grab legislation. With votes like McLachlan made today in support of HB1224, there is a reason we’ve begun referring to him as Rep. One Term. Perhaps he should have heeded Bill Clinton’s warning. « GUN CONTROL UPDATE: Where Are the Bills in the Legislature? It is the first step – it is 'control'. It's not about gun control, it's about CONTROL period. I am tired of politicians. It's just like Obama-care being shoved down our throats. LET US, THE PEOPLE VOTE on issues that have to do with personnel rights. REMEMBER, politicians are there to do what WE the people want not what they want. Government is out of control completely. I am sick of all of them in general. It's a gun grab…gun grab, gun grab, gun grab!!!! The legislation passed by the State House – IS NOT a Gun Grab as it takes away NO ONES guns – Please STOP calling it that!